Hi, a quick update in the way of IP Cam video clips of the May 14 keepers, and the Jul 14 keepers. 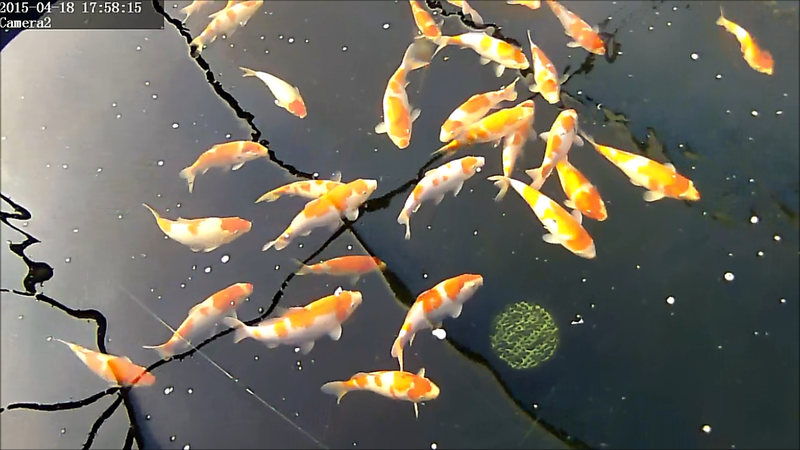 A snapshot from the Jul 14 tank; note the 2 step - it's the closest koi as your eye tracks outwards from the bottom drain in the 1 o'clock direction from the bottom drain. It's a terrible picture, I know... but I point out that one because it's got a decent 2 step pattern; most of the pattern markings are above the lateral line. head pattern comes down the head without going into the gill plates too much and stops at the line between the two eyes. It's growing reasonably well too which is a bonus, and the body shape is nicely balanced too compared to it's peers. Growth is noticeable through observation; in the May 14 tank - it appears in terms of length. And in the July 14 tank, it appears in the way of girth. Anyway - here are the vids, and you can see for yourself how they're getting on. Additional info: I have roughly 35 in the July 14 tank, and 22 in the May 14 tank. Ignore the 4 nissai males in the May 14 tank - the 2 large kohaku's and the 2 shiro's are bought in. The rest are my homebreds. The fry ponds are still green; but I've noticed a slight reduction in the green, in that I can now see through the water to a few cm's - perhaps 5 cm's. Which is a change from last week, and hopefully is a sign that rotifers are starting to take hold. Just need that process to speed along, and I need some warmer weather - particularly, warmer nights. And then I'll have a go in the spawning vat. I've a busy weekend with the family, but hoping to find time tomorrow to clean up the spawning area in the polytunnel.